Obituary – Roark, Vera Hazel (Maloch) « Perry High School Alumni Association, Inc.
﻿H. A. D. E. S. – ’21; Peroma – ’21; Glee Club – ’20; Sec.-Treas. – ’20; Basketball -’21; Class Play – ’20. Vera Hazel Roark, born September 18, 1902, in Perry, Oklahoma Territory, to James Edward and Margaret Jane (Lord) Maloch, died May 31, 2003, at the age of 100. 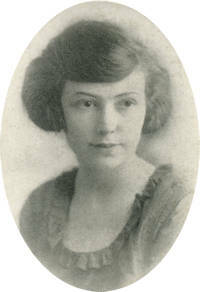 After her graduation from Perry High School in 1921, she and John William “Jack” Roark were married. She was employed at Holland Hall School in Tulsa for 20 years, retiring as Business Office Manager in 1967. A lifelong Methodist, she was a member of the University Methodist Church in Tulsa. Her husband, Jack, preceded her in death in 1945. She is survived by her son, Ed Roark and his wife, Rosemary; her daughter, Una Mae Barr and her husband, Bob; her grandson, Robert Barr and wife, Alice; granddaughter, Dr. Laurie Croft and husband, Jerry; 2 great-granddaughters; her sister, Margaret Greigo of California; and a number of nieces and nephews. She was a perfect daughter, sister, wife, mother and employee. A memorial service will be held at Memorial Park Chapel on Friday, June 13, 2003 at 2 p.m. Interment at Memorial Park Cemetery.